The University of Toronto runs their own film festival , but now in their ninth year they are trying something new. Instead of having it at Innis Town Hall over several nights, they are hosting it today, Saturday March 13 as an all-day event throughout Hart House (7 Hart House Circle). All events are free. One of my recent works The Audience will be playing at the Film Board Gala at 2pm and again at 8:30pm. The film was made with a grant from Bravo!FACT and stars Patrick McKenna and Sandy Kellerman. There will be a pre-screening catered reception in the East Common Room at 7:00, and post-screening reception and awards at 10:00pm. I hope to see you there. Other things to looks for include director Babak Payami in person in Hart House Theatre at 1 and 7:30pm to present a double bill of his work. You'll get a chance to see works by the Cinema Students at UofT. 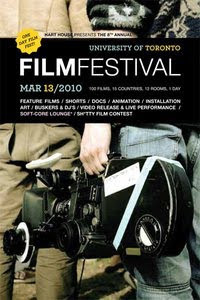 The very funny Keith Cole will present some gay short films. There will be installations, some Super8 film projection, music, discussions and much more. The whole-day event worked well and was a very enjoyable experience. I ended up winning a prize for Best Director for my short film The Audience. In addition, another film I worked on as cinematographer, I Want To Be A Desi 2 by Allan Tong, won the prize for Best Documentary. All in all a good day.